Everything’s made easy for you – you don’t need to bring along anything but yourself to have a great Goodleaf tree climbing experience. The tree is set up by us in advance and after an introduction and (short but necessary) health and safety session we demonstrate our tree climbing technique. We make sure you’ve learnt the ropes (ahem!) close to the ground before you head up the rope into the canopy. Once in the tree top, you can enjoy a birds-eye view of Appley Park and across the Solent to the Mainland. We have a couple of tree top hammocks and if you’re brave enough there’s time for branch walking and swinging around at 40 feet in the air! You don’t need to be super strong to climb trees with Goodleaf, however using our special system and technique you will be climbing the rope and tree independently. Popeye muscles aren’t needed either, just a sense of fun and adventure. Tree climbing with Goodleaf is about having as much tree fun as you can in a safe and friendly environment. 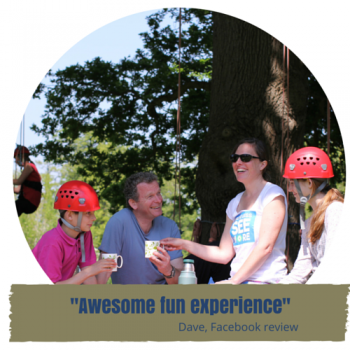 We provide everything you need; all the equipment, instruction, supervision, insurance – we even provide a hot cuppa and our delicious climbers flapjack for you to enjoy after you’ve descended from 50ft up in the canopy.